San Francisco, CA – Cloudflare, the leading Internet performance and security company, today announced a collaboration with IBM that will provide IBM’s enterprise customers with the benefits of Cloudflare’s edge computing solutions. 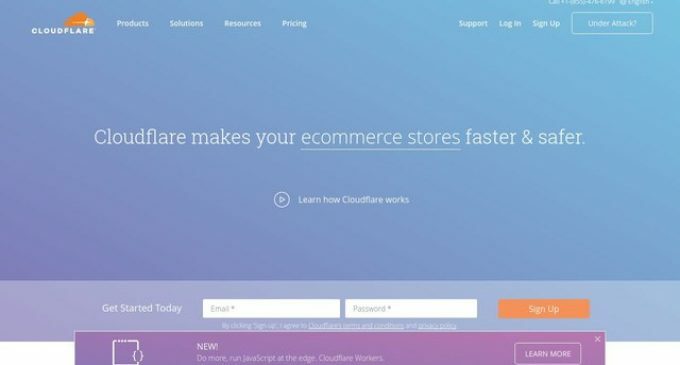 With this collaboration, IBM becomes an authorized reseller of Cloudflare’s suite of security and performance edge services. Cloudflare’s solutions can be deployed in IBM customer environments, including public, private, hybrid cloud, or on-premise. Through the collaboration, IBM plans to launch IBM Cloud Internet Services, a one-stop shop for enterprise network edge services. IBM Cloud Internet Services is designed to enable customers to more easily protect and accelerate their Internet properties—domains, applications, and APIs—through an integration of Cloudflare in the IBM Cloud console. Cyber security threats are increasing in scale and becoming more complex every day, but security should not be a barrier for enterprises entering the cloud. Enterprises crave a cloud and edge security strategy that provides state-of-the-art protection and performance. With IBM Cloud Internet Services, in just a few clicks, enterprises can obtain the benefits of Cloudflare’s massive global network and core DDoS, WAF, DNS, and web caching solutions, in one place, without having to rely on multiple vendors. Early access to IBM Cloud Internet Services will be available in the IBM Cloud portal on March 19. Tune in on Wednesday, March 21 at 11:30 am PT during the “Building Future-Proof Cloud Solutions with an Enterprise-First Cloud Infrastructure” keynote to hear Matthew Prince and John Considine discuss the news at IBM THINK. Cloudflare, Inc. (www.cloudflare.com / @cloudflare) is on a mission to help build a better Internet. Today the company runs one of the world’s largest networks that powers more than 10 trillion requests per month, which is nearly 10 percent of all Internet requests for more than 2.5 billion people worldwide. Cloudflare protects and accelerates any Internet application online without adding hardware, installing software, or changing a line of code. Internet properties powered by Cloudflare have all web traffic routed through its intelligent global network, which gets smarter with each new site added. As a result, they see significant improvement in performance and a decrease in spam and other attacks. Cloudflare was recognized by the World Economic Forum as a Technology Pioneer, named the Most Innovative Network & Internet Technology Company for two years running by the Wall Street Journal, and ranked among the world’s 50 most innovative companies by Fast Company. Headquartered in San Francisco, CA, Cloudflare has offices in Austin, TX, Champaign, IL, New York, NY, Washington, DC, London, and Singapore.